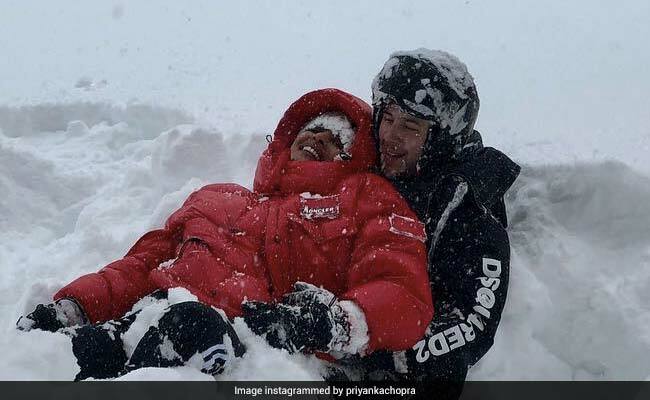 Nick Jonas shared a pic from "Super Bowl Sunday"
Priyanka Chopra and Nick Jonas are tucked away in the snow-caked Mammoth Lakes in California and enjoyed the Super Bowl on Sunday in the best possible way! On Instagram, Nick Jonas shared a photo from the winter wonderland, also featuring Joe Jonas, Sophie Turner and of course, Priyanka Chopra. It appears that before heading in to watch the game, the Jonas brothers sipped beer in their make-shift seats on the ice, courtesy Priyanka and Sophie, who built a beer tower for the boys. Priyanka best described it as the "Super Bowl hang," while Nick provided more details in his caption: "Happy super bowl Sunday everyone! Priyanka Chopra, Sophie Turner and Joe Jonas made this incredible winter tundra hang full of cold refreshing beers! Life is good." Priyanka Chopra is in California not just with the Jonas family but also with her mother Madhu Chopra. She shared an adorable photo, also featuring her niece Krishna Sky. "Winter diaries... family," she captioned the photo. Meanwhile at the Super Bowl, New England Patriots beat Los Angeles Rams to clinch their sixth NFL title under Tom Brady. Priyanka Chopra and Nick Jonas had a destination wedding in Jodhpur in December and have been globe-trotting together ever since. 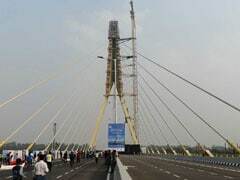 They are currently in the US but the 36-year-old actress shuttles between India and the US throughout the year. On the work front, she will soon be seen in Isn't It Romantic?, her third Hollywood film, which will release on Netflix India on February 28.